Let's take a look at the first month of the college basketball season and determine which games will have the biggest implications down the line. Getty Images Udoka Azubuike dunks against Villanova in the 2018 NCAA Final Four. The first game of the Champions Classic. There’s a lot to like in this matchup. Kansas enters the season ranked first in the AP Poll, and while some familiar faces return, the Jayhawks also have important new pieces. Kansas has won the last 14 Big 12 titles, and this is one of its most talented rosters during that span. It will be interesting to see how the offense looks. Who’s the number one option? Who’s the second? Will Charlie Moore initiate the offense most of the time, or will Bill Self give his impressive stable of wings some creative responsibilities? And then you have Michigan State, which lost Miles Bridges and Jaren Jackson but enters the season ranked 10th. A fun matchup to watch: Udoka Azubuike vs. Nick Ward. Ward is a per minute monster, but he’s had trouble earning Tom Izzo’s trust the last few seasons. He’s dominated when he’s been on the floor; Ward is averaging 27.1 points and 14 rebounds per 40 minutes for his college career. The defensive concerns are real, but the dude just wrecks people inside. But Azubuike is such a powerhouse. That’s going to be a heck of a game-within-the-game to monitor. These teams could be jockeying for top seeds come Selection Sunday. Getty Images Florida's Jalen Hudson. Perhaps lost in the excitement of the opening night of the season and the Champions Classic: Florida State takes on Florida. That’s a high-level game with a lot of emotion on both sides. The Seminoles are ranked 17th coming in and the Gators are unranked. But the computers think these two are pretty equal; Florida State checks in at No. 15 on KenPom while Florida is ranked 19th. But these teams are constructed much differently. Florida State is incredibly athletic and deep, but its overall skill level may not be as high as Florida’s. Jalen Hudson and KeVaughn Allen are a dangerous wing scoring duo, especially if Allen can return to his 2016-17 form. The good news for the Seminoles: wing defense is their specialty. They have a ton of bodies to throw at those guys, and Florida will need to develop a counter. Mike White is one of the smartest coaches in the game. This will be a fun chess match, and these teams will likely both snag single-digit NCAA tournament seeds. No, UMBC won’t get another shot at a likely 1-seed on opening night. But Marquette could make the NCAA tournament. Will UMBC continue to be a story in 2018-19? Sure, the Retrievers will be talked about forever, but it will be interesting to see what their next act is. They lose Jairus Lyles, who averaged 20.2 points per game last year. He did everything. K.J. Maura is gone, too. Marquette’s Markus Howard is also a blast to watch and could go for 30 on any given night. UMBC coach Ryan Odom, a hero last March, has likely been scheming Howard for months. This is a game worth following during the Champions Classic. Speaking of the Champions Classic, here’s the headliner. There’s no better matchup in terms of raw talent, and either of these teams could get the No. 1 overall seed come Selection Sunday. This game might be sloppy. The Champions Classic usually is; Duke and Kentucky won’t be operating at peak powers until midseason or so. But that’s part of the fun. Zion Williamson and R.J. Barrett have impressed at every turn. And Cam Reddish has a chance to be better than both of them. How long will Mike Krzyzewski stick with Marques Bolden? How much will the Blue Devils play zone? Where does Tre Jones fit into the offense playing alongside Williamson, Barrett and Reddish? And then there’s Kentucky. We also don’t really know what the Wildcats will look like. At first glance, Reid Travis’ and P.J. Washington’s games seem to overlap, but they’re both such good passers that they should be able to make it work. Regardless, that pairing is something to keep an eye on. Travis will likely be Kentucky’s first option, but he’s not the best shot creator on the team even if he’s the best player. The Wildcats have a bunch of guys who can initiate the offense but must be careful not to resort to my-turn, your-turn basketball. Two juggernauts going at it on the first night of the season. This one is worth staying up late for. A sneaky top 25 matchup on Friday night, and a rematch of Week 1 of the college football season. Washington fans are hoping for better luck this time. The Huskies are a trendy pick to win the Pac-12. It’s easy to see the appeal. Washington won 21 games last year and looked much better under Mike Hopkins than it had in prior seasons. Noah Dickerson is a stud; he’s the kind of guy who scares opponents and alters gameplans. Auburn is an intriguing opponent for them. The Tigers lost Mustapha Heron, but Bryce Brown is back, and Bruce Pearl always seems to get the most out of his group. Auburn has the requisite shooting to deal with the Washington zone. This will likely be a tight one and is particularly important for the Huskies. The Pac-12 isn't looking too strong and nonconference wins could prove to be crucial. The national title rematch is going to look a lot different than what we saw in April. 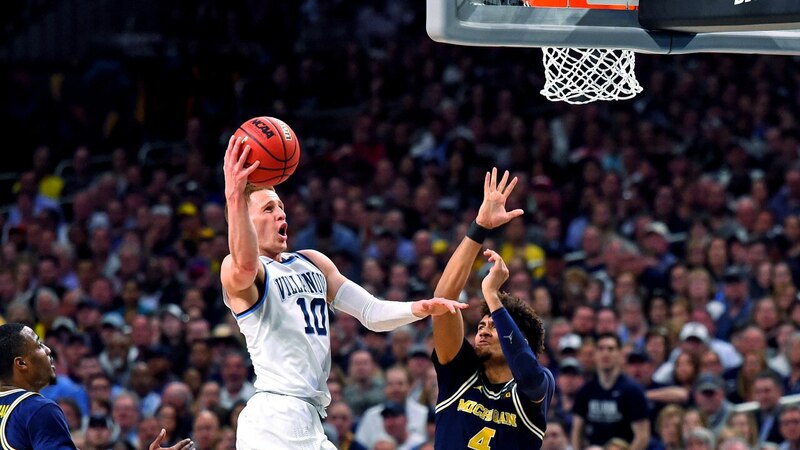 There will be no Jalen Brunson, Mikal Bridges, Donte DiVincenzo, Omari Spellman, Mo Wagner, Duncan Robinson or Muhammad-Ali Abdur-Rahkman. That’s a long list, but there’s plenty to like in this game. It will be fascinating to see how Villanova’s offensive hierarchy shakes out. Will Phil Booth take on an alpha dog role, or will the Wildcats spread the shots and touches pretty evenly? Can Eric Paschall go from ‘star role player’ to ‘star?’ A lot is riding on freshman point guard Jahvon Quinerly, too. It’s a similar story for Michigan, though we know Charles Matthews is the best player on the team. But the Wolverines could use a breakout season from Jordan Poole, and Zavier Simpson needs to carry a heavier offensive burden. The styles will look the same, but the players are drastically different than the last college basketball game we saw. We know a lot more about Auburn than we do about Xavier coming into the season. The Musketeers lost Trevon Bluiett, J.P. Macura and a few other veterans from last year's squad, but Xavier is such a consistent program that it feels like they'll be fine. Auburn presents a tough test early in the schedule. The Musketeers have a wide range of possible outcomes this year, but a win here would be a nice notch on the belt. North Carolina could be in contention for a 1-seed come Selection Sunday, and every quality nonconference win counts. This game will be one of Nassir Little's first chances to ball out against comparable talent, and it could be a game that vaults the Tar Heels into the conversation with college basketball elites with a nice performance. Texas loses Mohamed Bamba, but its stable of feisty, athletic guards returns, and Shaka Smart should be able to coach a more familiar style this season. A win over North Carolina would be the best thing on Texas' resume, unless it can beat Kansas at Kansas in 2019. UCLA has a good shot to win the Pac-12 this year, but as previously mentioned, nonconference games are crucial for all of those schools. Michigan State might be the Bruins' best shot to earn a signature win. Michigan State will come into this game battle tested, having already faced Kansas. The Spartans are more talented overall, but UCLA swingman Kris Wilkes presents a matchup problem for Michigan State. It's hard to guard 6-8 guys who can shoot and handle; the Spartans have plenty going for them, but they don't have an obvious choice to guard Wilkes. The Las Vegas Invitational field is loaded this year. This would be more intriguing if it was in Bloomington, but Indiana should be sneaky good, and the Blue Devils are young. It may take them a bit to find their footing. That's up in the air; Duke could also be awesome from the jump. But if Indiana can pull off an upset, a few things would likely happen: Romeo Langford would become a household name (if he's not already), and the Hoosiers would vault into the top 25. They'd be on the fast track to a nice NCAA tournament seed. Indiana probably doesn't have the horses to hang with Barrett, Williamson and Reddish, but few teams do. Anything can happen in a 40-minute college basketball game.